I still remember when I first drove the Audi RS 5 Coupe a few months ago – I was literally smitten by it. In fact, I’m still mesmerised by it. 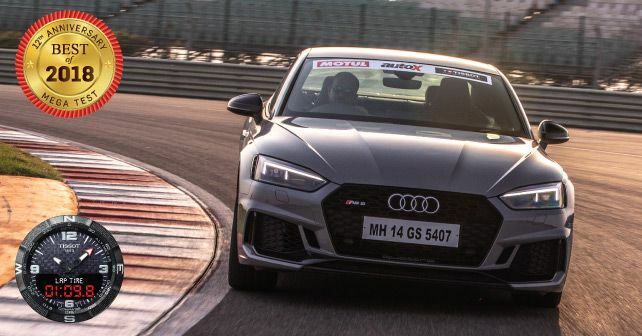 Yes, the Audi RS 5 Coupe can have the effect on you. And, to be frank, it doesn’t quite come as a surprise that it’s topped the charts this year. While it had some worthy competitors – the sensational Ferrari 488 GTB, the ruthless Mercedes AMG E 63 S and the extraordinary Lamborghini Urus – none are as amicable and sensible as this. You’d think that this is because the 2.9-litre, V6 twin-turbo only develops 444bhp, but you’d be wrong. The power is genuinely ferocious. But it’s the agreeable manner in which it delivers the power that makes it so easy to access. It can be a hooligan if you want it to – the 600Nm of torque ensures that. But it chooses to be obedient. It’s like Mohammad Ali in a tux. You know he can beat the bejesus out of you if he so chooses, but he’s too well-mannered for that. The RS 5’s party trick is the Quattro all-wheel drive system. While it’s slightly rear-biased, it does a great job of powering the axle that needs it the most. Add to that a torque vectoring system, and what you get is Velcro-like grip and confident handling. The new RS 5 has also shed more than 60 kilos – half of which is from the engine. Thanks to this weight reduction, the car doesn’t feel front heavy like the previous generation. Also, gone is the understeery nature of the car, however, a bit more feedback from the wheels could really have done wonders. On the track, it clocked a 1:09.8 – less than a second slower than the 612bhp AMG E 63 S. Now, that’s something! The RS 5 feels very much at home while switching direction. It has just enough drama to make you grin. That being said, you expect it to be a chore on the road, but it isn’t. And that’s what makes it so delightful. Even with the optional 20-inch wheels that wear 30-section tyres, the RS 5 rides reasonably well over bad roads – and that’s without adaptive dampers. Audi has nailed the RS 5 from a design standpoint too. While the first-gen model looked bulky and heavy, this one looks like it went through a rigorous fitness regimen. Sharp cuts and lines give this Audi a stance that’s deserving of an RS. The gloss honeycomb grille and those optional 20-inch wheels had us totally spellbound. The Audi has a few issues though – for instance, getting into the back seat is a bit like doing a yoga session, and don’t even get me started about the rear legroom. Other than that, however, the cabin and the attention to detail is unmatched at any price point. And, at `1.10 crore, the RS 5 offers good value for money too – well, everything’s relative! Consider the fact that the E 63 S is `60 lakhs dearer, while the Urus will set you back `3.5 crore and the Ferrari demands you to go north of `4 crore. The RS 5 is properly fast, properly desirable and everyday usable – what more could you ask for?